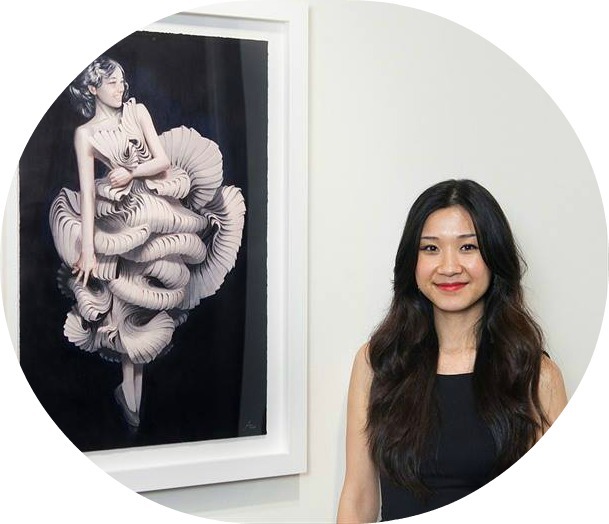 Tran not only creates beautiful work, she is equally stunning inside and out. This is the last weekend (well today really, Saturday March 15) to see the “New Works” show at Thinkspace Gallery in Culver City. NY artist Erik Jones and GA artist Tran Nguyen are showing in the main room, while Miami artist Alex Yanes takes over the project room. My favorite show of the year; there is a stunning balance of composition, beauty, and colorful fun through out the gallery. Erik Jones work connects Tran’s soft and ethereal pieces to Alex’s bold and chunky installation, although in separate rooms the entire gallery feels like a cohesive curated piece. Here is a quick interview I did with Tran about the show, make sure to check it our before it comes down on March 22, 2014. MAOI: How would one phonetically pronounce your name? Or would you like to give MAOI readers a special way/nickname to address you with? TN: My first name is pronounced “tron” like the movie and my family name is “wen”. In summation, “tron wen”. MAOI: How do you take your coffee or tea? TN: I recently made the transition from coffee to tea for health reasons. I like it simple with no additives and blazing Godzilla hot. TN: Yes — when I was creating “Living In a Forgotten Fissure I”. MAOI: What was playing in the background while you were creating this recent body of work; music, Netflix, other? TN: Ted Talks, The Amazing Race, artist podcasts, and a lot of music. MAOI: What do you really like or admire about the work of the other artists your showing with at Thinkspace Saturday March 1, 2014. TN: Erik’s and Alex’s works are incredible on their own, but I find it amazing how we all complement each other so well, with each bringing their own creative innovation. Erik’s is colorful like Alex’s while my work is figurative like Erik’s, and so on. Check out Tran’s first interview with My Favorite MAOI here.